Washington has commended Morocco’s constructive participation in talks on the Sahara held under the aegis of the United Nations and the UN Secretary General’s personal envoy for the Sahara Horst Köhler. This came during a meeting held Wednesday in Washington between US Secretary of State Michael R. Pompeo and Moroccan foreign Minister Nasser Bourita. The Secretary of State who acknowledged Morocco’s constructive participation in talks with the UN Personal Envoy for Sahara also thanked Morocco for its resolute efforts to counter Iran’s malign influence in the region. 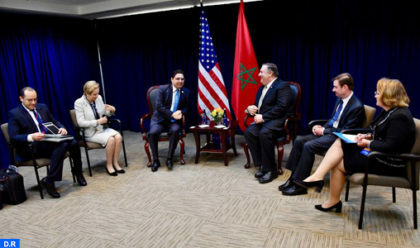 The meeting reviewed the longstanding strategic partnership between the United States and Morocco and the opportunities to expand bilateral cooperation on regional issues. The two countries’ top diplomats also discussed the upcoming Ministerial meeting to Promote a Future of Peace and Security in the Middle East, noting that it would be an important step toward building a stronger security framework in the Middle East. Secretary Pompeo also thanked the Moroccan Foreign Minister for his support of Venezuelan Interim President Juan Guiadó. The Moroccan-American talks coincided with the meeting in Washington of a working group of the U.S.-Morocco Strategic Dialogue in order to strengthen cooperation on common interests in Africa. Delegations from the United States and Morocco agreed to build on ongoing initiatives to address political, economic, and security issues facing the continent. The delegations discussed new opportunities for possible trilateral cooperation on the continent, including in development finance, trade, and youth empowerment; countering terrorism; building the capacity of security services in the region; and strengthening governance. Morocco also took part in the meeting of the Global Coalition to Defeat ISIS held Wednesday in Washington to discuss the impending territorial defeat of Daech in Iraq & Syria and agree on the next steps in degrading Jihadists global networks. This meeting comes after the withdrawal of U.S. forces from Syria to coordinate actions of the global coalition to continue to destroy ISIS remnants and thwart its global ambitions. In remarks to the gathering, President Donald Trump said the United States is determined to prevent a resurgence of ISIS in Syria and Iraq after the withdrawal of US forces from Syria takes place, and remains committed to working with the Global Coalition to continue to destroy ISIS remnants and thwart its global ambitions. “As ISIS is defeated on the battlefield, the Coalition will continue its stabilization efforts to facilitate the safe and voluntary return home of those who have been displaced by the violence,” he said. The Global Coalition regularly meets to coordinate and enhance combined efforts to counter ISIS. The last Ministerial took place in Brussels on July 12, 2018, with select members of the Coalition. The last meeting at the Political Director level took place in Rabat, Morocco, on June 26, 2018.